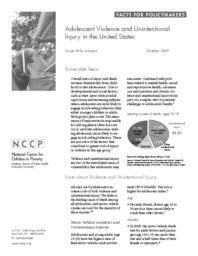 Overall rates of injury and death increase dramatically from childhood to late adolescence. Due to developmental and social factors, such as time spent without adult supervision and increasing independence, adolescents are more likely to engage in risk-taking behaviors than either younger children or adults. Biology also plays a role. The maturation of brain networks responsible for self-regulation often does not occur until late adolescence, making adolescents more likely to engage in risk-taking behaviors. These are just a few of the factors that contribute to greater risk of injury or violence in this age group. Violence and unintentional injury are two of the interrelated areas of vulnerability that adolescents may encounter. Combined with problems related to mental health, sexual and reproductive health, substance use, and nutrition and obesity, violence and unintentional injury form part of a complex web of potential challenges to adolescents' health.